Hamster PCSK9, His Tag (PC9-H52E4) is expressed from human 293 cells (HEK293). It contains AA Gln 30 - Ser 691 (Accession # G3GTK5). The protein has a calculated MW of 73 kDa. The protein migrates as 18 kDa and 65 kDa under reducing (R) condition (SDS-PAGE) due to glycosylation and proteolytic digestion. 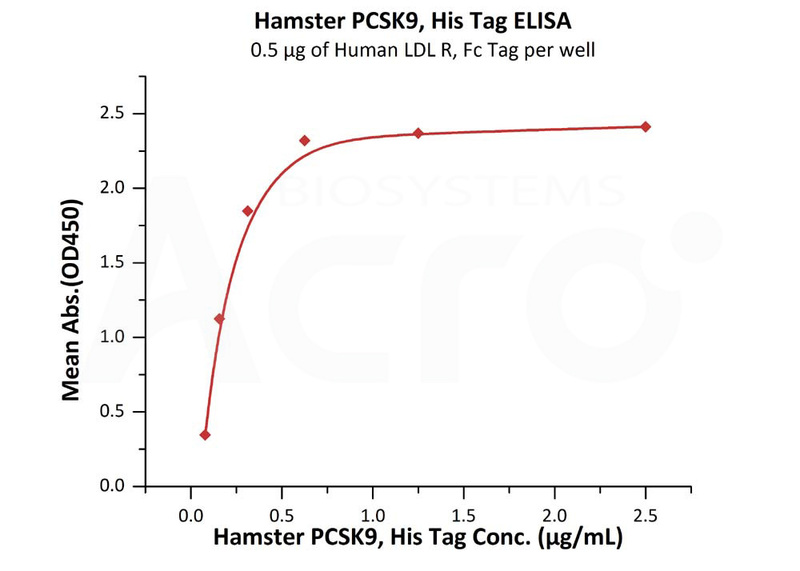 Hamster PCSK9, His Tag on SDS-PAGE under reducing (R) condition. The gel was stained overnight with Coomassie Blue. The purity of the protein is greater than 95%. 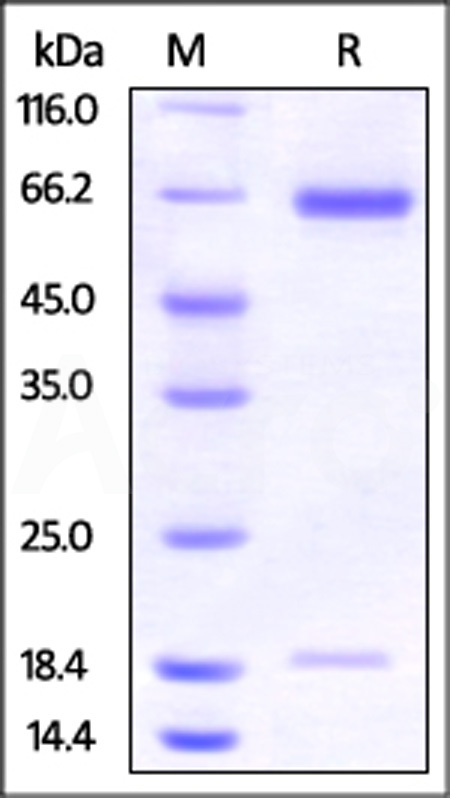 Immobilized Human LDL R (High Purity) Protein, Strep Tag (Cat. No. LDR-H5281) at 5 μg/mL (100 μl/well) can bind Hamster PCSK9 Protein, His Tag (Cat. No. PC9-H52E4) with a linear range of 6-50 ng/mL (QC tested). Proprotein convertase subtilisin/kexin type 9 (PCSK9) is also known as NARC1 (neural apoptosis regulated convertase), is a newly identified subtilase belonging to the peptidase S8 subfamily. Mouse PCSK9 is synthesized as a soluble zymogen, and undergoes autocatalytic intramolecular processing in the endoplasmic reticulum, resulting in the cleavage of its propeptide that remains associated with the secreted active enzyme with a broad alkaline pH optimum. This protein plays a major regulatory role in cholesterol homeostasis. PCSK9 binds to the epidermal growth factor-like repeat A (EGF-A) domain of the low-density lipoprotein receptor (LDLR), inducing LDLR degradation. PCSK9 may also have a role in the differentiation of cortical neurons. Mutations in this gene have been associated with a rare form of autosomal dominant familial hypercholesterolemia (HCHOLA3). (1) Seidah NG, et al., 2003, Proc. Natl. Acad. Sci. U.S.A. 100 (3): 928–33. (2) Abifadel, M. et al., 2003, Nat. Genet. 34: 154-156. (3) Dubuc G. et al., 2004, Arterioscler. Thromb. Vasc. Biol. 24 (8): 1454–9.